This delicious caramelized rice pudding recipe is not the usual Greek rice pudding (ryzogalo). The classic dessert is made in a completely different way resulting in a decadent new dessert. However, ryzogalo is a dessert I have tweaked many times an still have many ideas to make it different. See the linkks at the end of the post. Last week we were without electricity for three days, so on Saturday evening when the electricity was restored it was too late to go shopping. On Sunday I wanted to make a dessert but unfortunately there was no fresh milk, no eggs, no butter, no heavy cream (you get the point), so I opened the closet and found a can of evaporated milk, a can of coconut milk, rice flour and sugar. What I made was a combination of Crème caramel and Kazan Dipi. Kazan dipi has its roots in Turkey and is very different to what I have made as it uses chicken breast in the dessert. Although I was very skeptical when making it, it turned out amazing. I prepared a caramel which I spread on the baking tin and then the pudding was added on top of the caramel. By the time the cream is added the caramel crystalizes but while baking it in the oven the caramel melts again and when bubbling it infuses the pudding with the caramel flavour. The texture of the pudding was pleasantly elastic but it was creamy, refreshing, voluptuous, delicately flavored, subtly sweet as well as luscious. In a non stick frying pan add the sugar, water and lemon juice and bring to boil. Lower heat and stir constantly until the sugar starts turning brown. Empty caramel syrup into a 28 cm / 11 inch baking tin and spread it quickly with a spoon, while hot. (Make sure to fill frying pan immediately with water as the caramel will get stiff and will be difficult to clean). In a saucepan, add the coconut milk, evaporated milk, water, sugar, mastic, rice flour and mix to combine. Put on the heat mixing it continuously with a balloon whisk, until the mixture reaches boiling point. Preheat oven at 180 C / 350 F. Pour the pudding on top of the caramel and bake for about 25 minutes or until it begins to bubble. To serve, wet a flat bowl with orange blossom water – cut into pieces and ‘flip’ the pieces on the bowl – the caramelized part should be on top. Refrigerate for a few hours. Serve as it is but it is more delicious served with either Whipped Cream or “Kaimaki” Ice Cream and Marinated Strawberries in Brandy. Note: Kaimaki is a Greek ice cream flavoured with mastic and sahlep. In a non stick frying pan add the sugar, water and lemon juice and bring to boil. Lower heat and stir constantly until the sugar starts turning brown. Empty caramel syrup into a 28 cm / 11 inch baking tin and spread it quickly with a spoon, while hot. (Make sure to fill frying pan immediately with water as the caramel will get stiff and will be difficult to clean). To serve, wet a flat bowl with orange blossom water - cut into pieces and 'flip' the pieces on the bowl - the caramelized part should be on top. Refrigerate for a few hours. Serve as it is but it is more delicious served with either Whipped Cream or "Kaimaki" Ice Cream and Marinated Strawberries in Brandy. This recipe is linked to my event Creative Concoctions #3: Desserts. You can still send your creative desserts until the 6th of May. Rozotto, is another original recipe of mine, posted on my other blog. Mmmhhh, that looks terrific! I bet it would be very successful at home. Wow wat an irresistible spread, pudding looks truly fabulous.. The rice pudding looks really great! The way you describe the caramel is irresistible! I feel bad that you had to go so long without electric! I'm glad it's back. Ciao Ivy ! I’d just love it ! It’s my preferred dessert ! This dessert sounds delicious, and easy to make as well! I love creating tasty recipes from ingredients I have at home. In your recipe I can smell the mastic and the blossom water :-)! Three days without electricity! poor you! Often the best dishes are born out of an empty pantry. This looks like one of them. What a delicious recipe! It makes me think of my husband because I know he'd love it. The rice pudding sounds just heavenly with that caramel topping! Love it! You are so creative and resourceful! 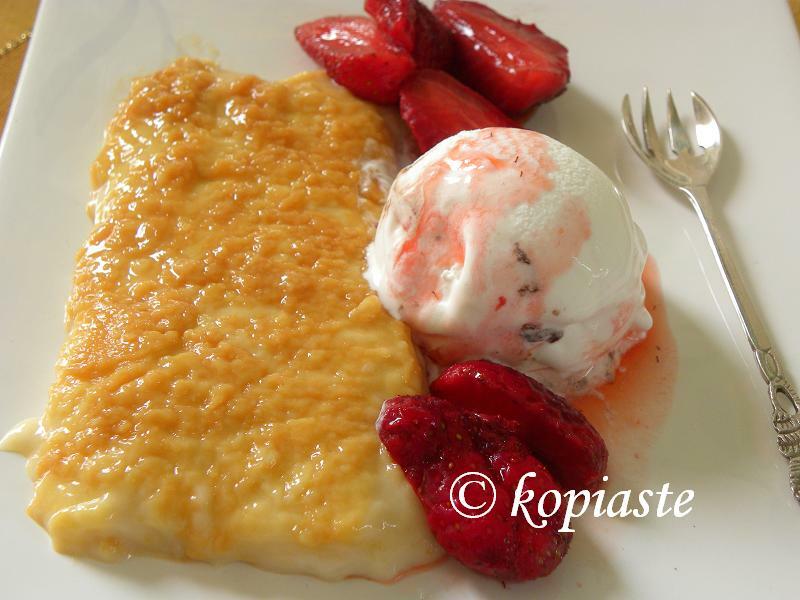 I have had Kazan dipi once in thessaloniki and enjoyed it for breakfast (although I'd take bougatsa over it ANY DAY) 🙂 Still tasty 🙂 I bet your fusion was amazing. This looks great! Just came across your wonderful blog & am a new follower! Oh wow! Ivy this is great thinking on your behalf with only limited foods and resources…plus there is caramel too! a very yummy dessert ,ivy! Sounds and looks delicious – anything with coconut milk wins me over. What a delicious result of being so resourceful! My recent post 30 by 30- Pozole and Happy Cinco de Mayo!